Two new artworks are now hanging at the gallery by local artist Nicola Reeves. Scott is pleased to be given the opportunity to exhibit a collection of paintings completed in the 2 years since his first exhibition at the Green Island Gallery. In this collection, Scott has developed the elements of observation and drawing as the basis of a composition. Perspective and tonal relationships are explored as the basis of enhancing a painting while keeping the looseness of the medium at play. Several of the paintings look at regional themes and are presented as triptych works or familiar groupings with the aim of creating feelings of recognition and resonance with the viewer. A number of the paintings were completed outdoors in moments of quiet interlude from busy family life. 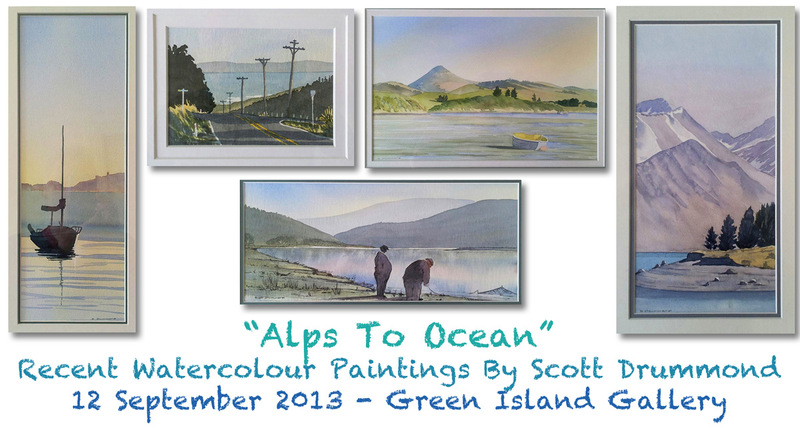 The theme of Alps to Ocean, reflects Scott’s enjoyment of these diverse environments with the theme of water reflected in almost all the works on show. This month it is Variety Month with a variety of art work from a number of artists. My late father, Tom Esplin, was a very successful painter in oils, and he painted in a distinctive impasto style using a spatula to apply the paint to the painting surface. The result was colourful and vibrant, and the texture gave his paintings an almost three dimensional quality. Dad and Mum travelled extensively Worldwide, Dad with his camera took many photographs wherever they went in order to use them as painting subjects when he returned home. My mother wrote detailed diary notes, and the combination of paintings and writings formed the basis of the book “Esplin” that my brother Clark and I published in 2007 and that has now sold over 3,000 copies. After returning home, I also painted the landmarks and landscapes I had seen, taking photographs in the same way as my Dad, and painting watercolours on my return home. It occurred to me recently to mount an exhibition with the title, “In The Steps Of My Father” featuring my paintings of the places and countries both my parents and I have visited over the years. 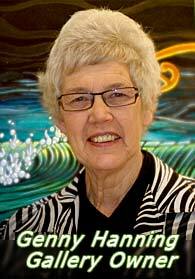 In partnership with Genny Hanning of the Green Island Gallery, this ambition will come to fruition with an exhibition opening on Friday, 14 June 2013 at the gallery in Main South Road, Green Island, and running to Thursday 11 July. To mark the occasion, I have published a book of my paintings of the places I have travelled to throughout the world, and I have included text that outlines the stories around many of the works. Not surprisingly the book is entitled “In The Steps Of My Father” and will be available for purchase at $50 for the duration of the exhibition. For those of you who would like the book, but are unable to attend the exhibition, I am happy to mail copies to you if you add $10 postage and packaging to the price. The book has a hard cover, and features 75 paintings and drawings of locations in 17 countries over 20 pages, and it measures 215mm x 295mm. 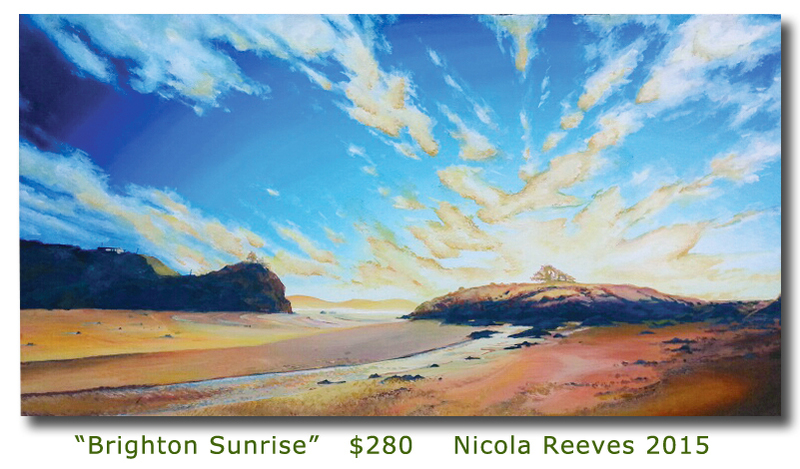 Email me at ron@ronesplin.co.nz with your postal address and deposit payment to BNZ a/c “For Brian Snell Limited” 020912 0027054 00.
at The GREEN ISLAND GALLERY 194 Main South Rd, Green Island Free parking. He brings to his photographic art more than 50 years of experience and achievement. 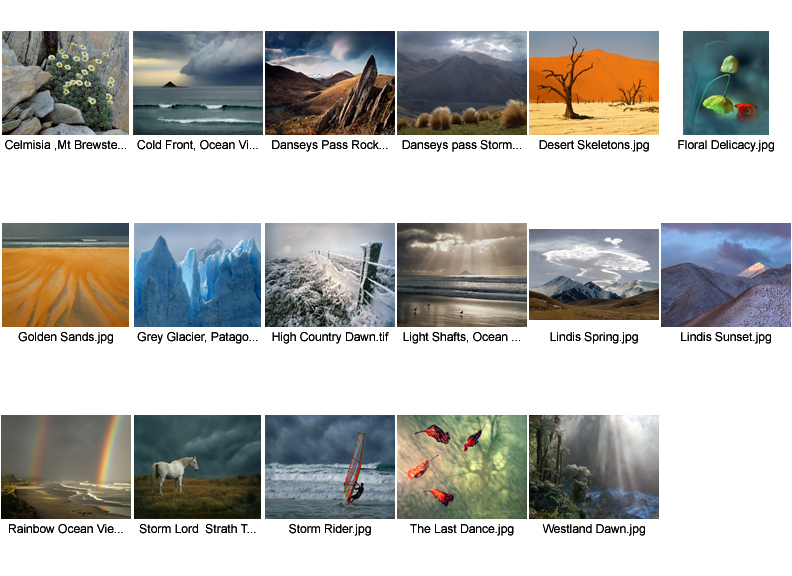 He is well known in both photographic circles and in the wider community for the quality of his award winning images exhibited both nationally and internationally. A. John V. Hart brings to his photographic art more than 50 years of experience and achievement. He is well known in both photographic circles and in the wider community for the quality of his award winning images exhibited both nationally and internationally. When he retired from regular competitive exhibiting a few years ago, he had won more gold medals than any one else in the history of the PSNZ National Exhibition which has been running for over 60 years. John has also had a high profile as both a judge and guest speaker while his work has been seen in many publications over the years. He is a longstanding member of both Photographic Society of New Zealand and Dunedin Photographic Society. John’s particular strengths are his ability to identify interesting and unusual subjects even in unlikely situations, and to organise these in creative compositions using quality lighting that enhances the subject. A versatile photographer who has travelled extensively in New Zealand and overseas, his extensive collection includes landscape, seascape, human interest, nature, photojournalism, abstract design, and experimental processes. However, it is the natural environment which is his first love. He resides at Ocean View overlooking Dunedin’s wild and moody south coast. John has also been a keen oil painter and follows all aspects of the creative arts, thus bring a broad perspective to his work. 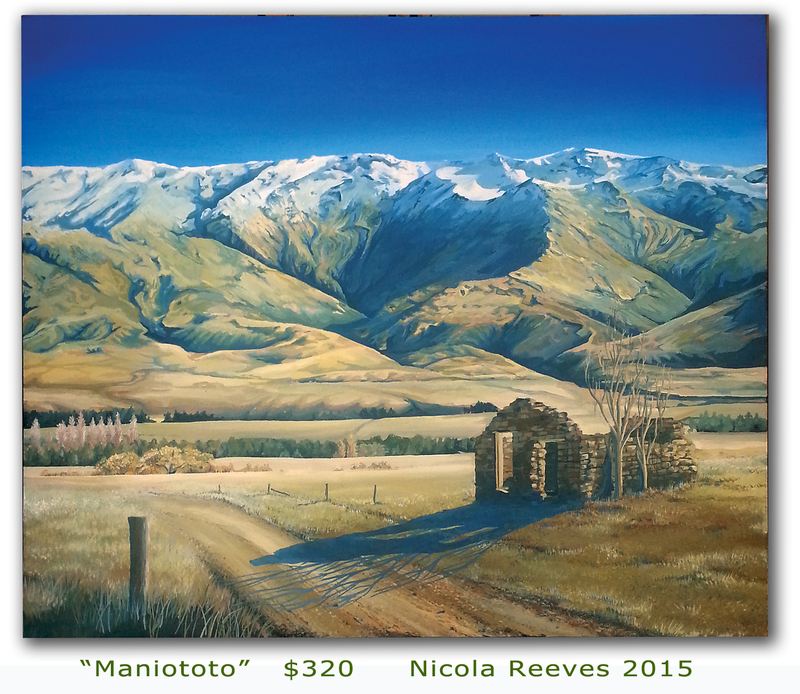 He is an Artist Member of Otago Art Society. In this exhibition, John has chosen to use the wrap around canvas medium for his photographic images. He sees this as an interesting way to suggestively link his creative environments involving film, digital technology, palette and easel. 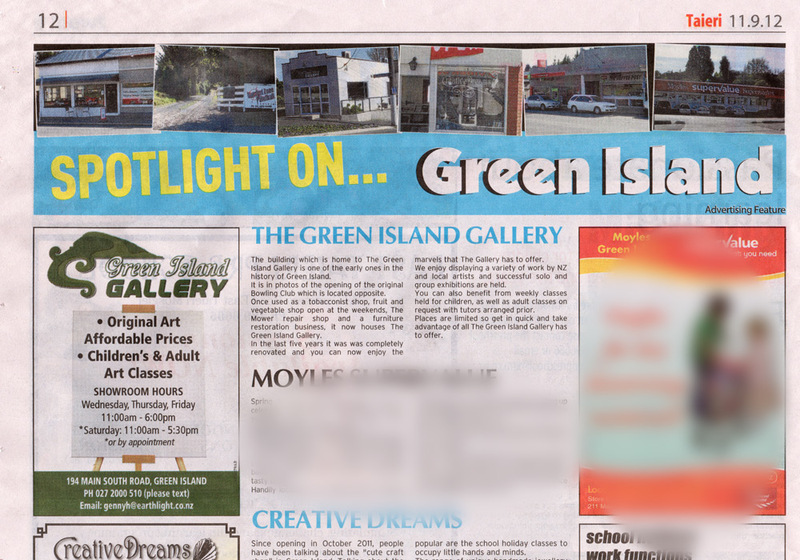 The gallery features in a Taieri Herald feature on businesses in Green island this week! 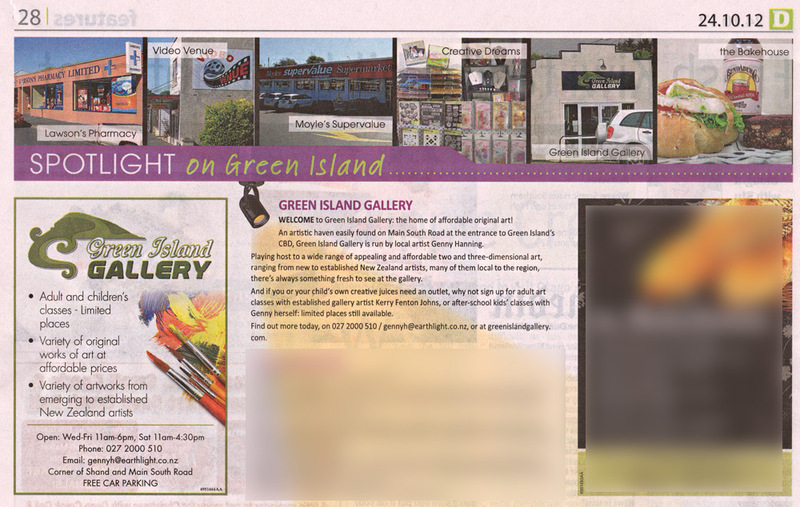 Thank you for visiting the website of the Green Island Gallery. 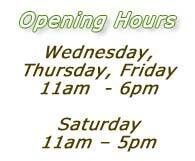 Please come and visit us soon, we have an affordable range of Gifts for family and friends, check out our opening times below.